Each tier of this bohemian-chic olive green skirt is accented with earthy cream and brown patterns and decorated with brassy metallic sequins for wonderful, woodsy charm. Intricate bands of crochet separates the tiers, with the lowest band unlined for a flirty peek of skin. A border at the hem adds to the flared look. Eye-catching skirt features an elastic waist that stretches for a comfort fit, and loose flow for a flattering, feminine look. The crinkle texture makes this piece perfectly packable for travel. Beautiful skirt looks great at the office when paired with a solid color blouse or cardigan. For a casual hippie-chic look, wear it with a tank or halter top and a cute pair of sandals. Skirt is 100% cotton, and measures 32" long. Available in sizes Small, Medium and Large. 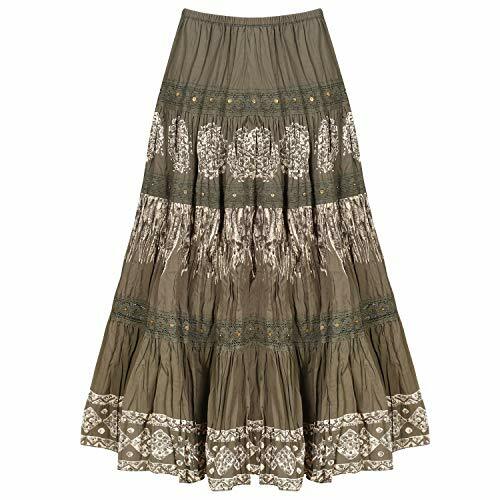 Hand wash.
BOHEMIAN CHIC - Each tier of this olive green skirt is accented with earthy cream and brown patterns and decorated with brassy metallic sequins for wonderful, woodsy charm. DELIGHTFUL DETAILS - Intricate bands of crochet separate the tiers, with the lowest band unlined for a flirty peek of skin. A border at the hem adds to the flared look, and the crinkle texture makes this skirt perfectly packable for travel. STYLISH COMFORT - Eye-catching skirt features an elastic waist that stretches to fit and loose flow for a flattering, feminine look. FROM WORKDAY TO WEEKEND - Beautiful skirt looks great at the office when paired with a solid color blouse or cardigan. For a casual hippie-chic look, wear it with a tank or halter top and a cute pair of sandals. NATURAL MATERIAL - Skirt is 100% cotton, and measures 32" long. Available in sizes Small, Medium and Large. Hand wash.